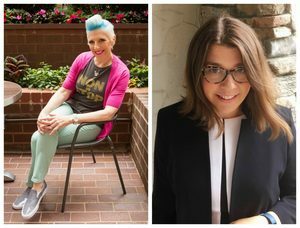 Southport, CT - Pequot Library will be the host site for "Love Your Body, Feed Your Soul: From Starving & Stuffed to Fulfilled & Enough", a 3-part workshop led by Lisa Lampanelli and Thea Martin. Lisa Lampanelli and Thea Martin have put together a workshop to give you the tools you need to put you on a path to inner peace when it comes to food and body image. Using storytelling, sharing, meditation, journaling, brainstorming, deep listening, and self-reflection, they hope to help you stop suffering and end the obsession. Registration required. $75/participant for all three sessions. Lisa Lampanelli has a career spanning more than 30 years and she has been a constant on the comedy scene, with numerous tours, Grammy nominations, and national TV guest appearances and specials under her belt, Lisa made national headlines in 2012 when she lost more than 100 pounds with the help of bariatric surgery. The comedian went on to speak with unflinching honesty about her lifelong food and body-image issues, and has since gone from insulter to inspirer. Thea Bourke Martin, JD, E-RYT: A certified yoga teacher with Yoga Alliance and an attorney at Lafferty & Martin LLC, Martin endeavors, in her workshops and classes, to create a healing, supportive environment in which students can listen to their bodies. She calls on students to observe themselves without judgment so that, over time, they can come to love their bodies, quiet their minds, and find happiness. Through her work as a mediator, trainer, and coach, Martin helps people create meaningful change in their lives.